Place an uncooked or “cook before eating” ham (See Index Card G), fat side up, on a rack in a shallow baking pan. (Have ham at room temperature.) Bake in a moderately low oven, 325°, using chart below. About 45 minutes before end of baking time, remove ham from oven. Slit rind with scissor and peel off. 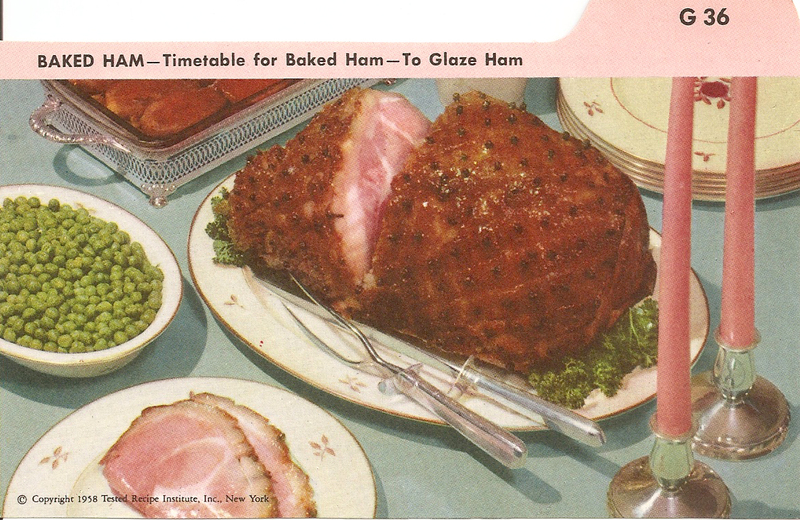 If a glaze is desired, proceed as directed below before returning ham to the oven to complete baking. TO GLAZE HAM: With a sharp knife, make cuts 1/4 inch deep in the fat in a diamond pattern. Stud with whole cloves. Make a paste of 1 1/2 cups firmly packed brown sugar, 3 tablespoons prepared mustard, and a little water; pat over surface. Bake 45 minutes longer; baste frequently with ham fat. This is a perfectly acceptable dinner. What has happened to you?